"Give me Adrian Newey and we don't need the best driver to win." 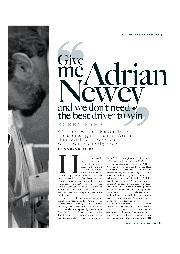 His designs would define the most technically advanced years of Formula 1 we'd yet seen, but first Adrian Newey had an apprenticeship to serve. He wouldn't earn his chops in Grands Prix racing, though, and not even on the race tracks of Europe. 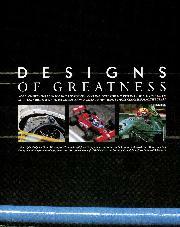 Instead, the foundations of Newey's future success were laid in America, in the rough-and-tumble world of Indycars. 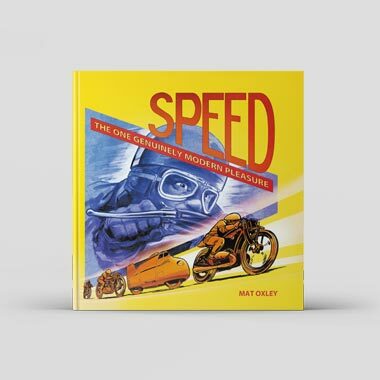 Road courses, street tracks and ovals: for a fresh young English engineer, it was an alien world. Newey spent his formative years working at March Engineering under Robin Herd's tutelage. 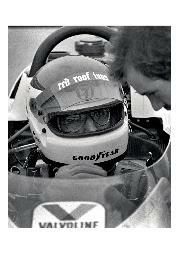 After graduating from Southampton University Adrian went to work for March in 1982 where he race-engineered Johny Cecotto's Formula 2 car and worked as a junior draughtsman in March's drawing office. He was also put in charge of developing the 83G IMSA GTP car and engineered IMSA champion Al Holbert's car in three races in 1983. Newey's career took a new turn in 1984 and '85 when he was assigned by Robin Herd to work with Bobby Rahal as a race and development engineer. After racing successfully in Formula Atlantic, F3, F2 and Can-Am, and trying without success to break into F1, Rahal went Indycar racing in 1982 with mentor Jim Trueman's Truesports team, run by ex-Team VDS F5000 and Can-Am team manager Steve Horne. Like Rahal, the team were expert road racers, but oval track virgins who learned a lot in their first two years in Indycars. Newey recalls that when he joined Truesports he found himself on a steep learning curve. "I was very wet behind the ears," Adrian admits. "The first track we went to was the short oval at Phoenix and I had never seen an oval before. So it was a bit of an eye-opener, trying to understand how you engineer a car that is set up only to turn in one direction. "Bobby, in particular, and Steve to an extent, were very patient with me, letting me get up to speed with what was involved. Through the early tests it was very much them teaching me rather than vice versa." In 1984 Nigel Bennett designed an all-new Lola Indycar, the T800, and Mario Andretti swept to that year's CART championship driving one for Newman/Haas. 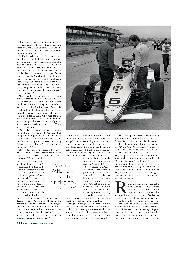 "The '84 March was quite a big car and the '84 Lola was definitely the car to have that year," Rahal recalls. "But over the course of the year Adrian re-engineered the March and that's where our relationship started. Adrian and I developed a very strong relationship on and off the track. On the track he practically knew what I was going to say before I said it, so we were able to work together to improve the car and make it better and better." 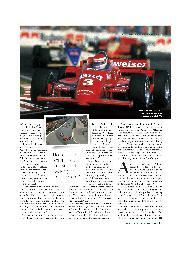 Newey recalls the development work he did with Truesports in 1984. "Frankly, the car wasn't very good," he says. "We worked hard to take what was a bit of pig's car and refine it as best we could. The Lola was definitely the benchmark, but by about two-thirds of the way through the season we got the car to be more or less a match for the Lola. We revised the front and rear suspension, reduced the angle of the engine to try and lower the centre of gravity, and we got some weight out of the car. We put a lot of work into it. 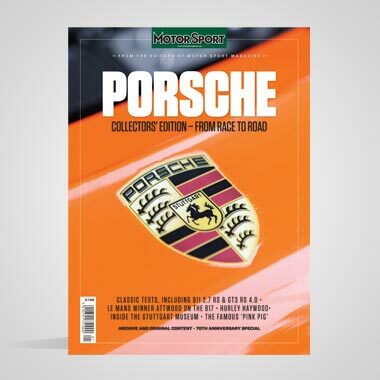 "On the basis of that development Robin put me in charge of designing the '85 car, which brought its own pressures because that meant I had to ferry backwards and forwards across the Atlantic, doing the dual tasks of running Bobby and developing the '84 car, and starting to lay out the '85 car." Newey designed a new, smaller March for 1985. "The '85 car was where you could really begin to see Adrian's influence," Rahal observes. "He just had that touch to try to make the car smaller and more efficient." Rahal finished third in the '84 CART championship and was third again in '85. He took seven poles and won three races in '85, challenging for the championship until he was taken out by Jacques Villeneuve Sr at the tiny Sanair oval in Quebec. "Adrian, myself and the team developed a lot over those years," Rahal says. 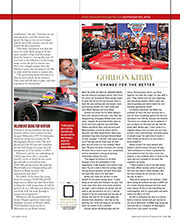 "I'd like to think that Truesports gave Adrian a lot of insight into running and racing the car. It's easy to design a car, but it's another thing to understand how it works in the real world and how easy it is or isn't to maintain. Can the mechanics get at stuff? Is it workable rather than just a piece of engineering art? Is it user-friendly? 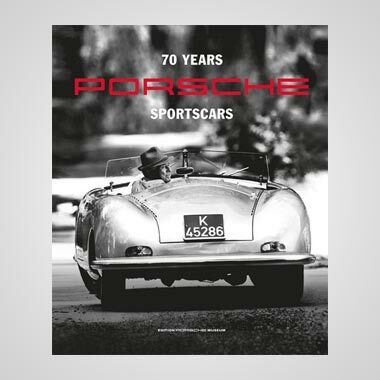 "I'd like think that by working with us in those very formative years Adrian took heed and gained an understanding about how things work in the real world, and that over time that knowledge enabled him to design better and better cars. And I think from a driver's standpoint I had such implicit faith in Adrian that if he told me we were going to put the rear wheels on the front and the fronts on the rears I would have said 'Go for it!'." Newey agrees with Rahal’s assessment. "Bobby was very good to work with and reasonably quickly we developed a very good working relationship," he says. "We got to the point where we could actually translate what each other was saying. It wasn't actually the words you used, it was the intention of what you were trying to achieve that became the real way of operating. "It's great when you achieve that. I think in reality I achieved that with very few drivers, probably with Bobby more completely than any other driver. I could translate what Bobby wanted without him actually having to go into every detail in what he was trying to describe." 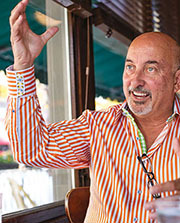 Newey developed a close friendship not only with Rahal and his wife Debi but also with Bobby's father Mike and mother Barbara. "I was basically emigrating through the summer in 1984 and '85," Adrian recalls. "I was 25 at the time and it was quite a big move, socially as well as technically. Bobby and Debi were great. They really helped me settle into America and I also struck up a very good relationship with Mike and Barbara. They kind of became my surrogate grandparents while I was over there, not just through the Truesports years but also subsequently at Kraco and Newman/Haas. They were all very welcoming and Bobby, his parents and I often went our to dinner and spent time together." Rahal expands on his friendship with Newey. "When Adrian came on we not only worked together but we would socialise and spend a lot of time together. We became very close and our ability to communicate and his ability to understand what I was saying was strengthened as much by the off-track relationship as by the on-track relationship." Rahal believes one of Newey's biggest strengths is having an open, inquiring mind that's rooted in reality rather than theory. "I think what makes Adrian who he is, is not just his brilliance as a designer and his creativity and imagination, but he's also looking at which way the wind's blowing," Rahal observes. "He's not one of these engineers — and there are lots of them — who just bury their heads in the computer. They don't look up from the computer and see what's going on out there. "I think that's a combination you don't see very often, and on top of that Adrian's an extremely competitive guy. He is an engineer who thinks that ultimately the competition is what determines whether you're successful or not. I've sometimes run into engineers who just look at the piece and ask, is it designed as best as it can be? That's the only interest for them. It doesn't matter how well it goes on the race track. "I think Adrian is one of these engineers — and I imagine Cohn Chapman was very similar — where it's all about having a beautiful car that's engineered to the T, but ultimately it's all about how it goes on race day. His own competitive spirit is what has separated Adrian from the others for many, many years." But at the end of '85 Maury Kraines outbid Jim Trueman for Newey's services. Kraines owned Kraco Car Stereos and ran an Indycar team at the time with a young Michael Andretti driving. "Without question that was a huge blow for me when Adrian went to Kraco at the end of the '85 season," Rahal remarks. "Adrian says it was all over $5000. I don't know if that's true or not because I didn't negotiate the deal. But for just a small amount of money Robin Herd ended up taking Adrian to Kraco for 1986. 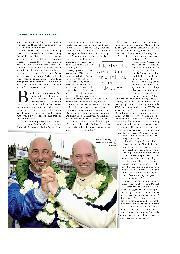 We had such a great relationship and had won a lot of races and I thought, 'How could that happen? How could you let a guy like that go?'." Newey explains his reluctant decision to move to Kraco. "That was a real shame to be perfectly honest," Adrian admits. "It wasn't particularly my wish to move to Kraco. I was very happy at Truesports. I had a great working relationship with Bobby and got on very well with all the guys there, including Steve Home who was very straightforward. It was a good relationship and it really came down to two things. "I think Robin was keen to move me to move me Kraco because he was doing a sales pitch on Maury and from a career point of view I didn't want to upset Robin. But financially it became a very attractive offer as well. In the end Steve offered about 10 per cent more than I'd earned through '84 and '85 and I thought, frankly, if that's the way you value me I'll keep Robin happy and go for the extra cash. "That's probably the only time in my career that I've moved at least partly for cash. But when you're 25 a big salary increase is quite attractive. Whether it was the right move or not, who knows? But it was certainly not a move that I necessarily wanted to make. It had lots of positives but it was a shame not to be working with Bobby and, of course, ironically they turned out to be his championship years. He managed it without me." 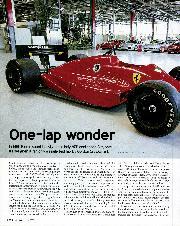 Another factor was Ferrari's politically inspired proposal for Truesports to run a Ferrari Indycar in 1986. To this end Rahal and the team tested an '85 March at Fiorano and Ferrari offered Newey a job as their chief Indycar designer. "I turned it down because I was happy at March and I wasn't convinced that Ferrari was the right long-term career move for me." Despite Newey's departure, Rahal won the Indy 500 in '86 and took the first of two consecutive CART championships with Grant Newbury engineering his car. In 1987 Truesports switched from March to Lola chassis for its successful title defence. Meanwhile, Newey departed March's employ at the end of '86 to work for Carl Haas's new Formula 1 team. But then Haas lost his sponsor and Newey wound up working for Newman/ Haas in Indycar racing in '87 engineering Mario Andretti's car. "We won the championship in '86 and in '87, we beat Adrian again that time with a Lola," Rahal recalls. "He was Michael's engineer at Kraco in '86 and Mario's engineer at Newman/ Haas in '87 and we beat him both times. So maybe we proved that it wasn't all Adrian." 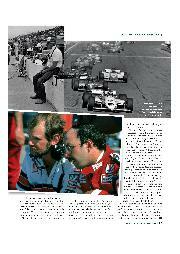 Newey warmly recalls his time in Indycars during CART's heyday. "It was a very stimulating four years," Adrian says. "I learned a lot through those years. Mario was another driver I had that special working relationship with, and Michael to a lesser extent. I would say the strongest relationship was with Bobby and then Mario, but Michael and I started to get a good understanding. It's ironic that of the five drivers that I would say I achieved that with, three were drivers I engineered in Indycars." He won't name the other two. "I should probably keep that to myself," Adrian grins. As Newey moved on in 1988 to design Leyton House's F1 cars, and then make his big move to Williams, Rahal expanded his retinue in 1992 to become a team owner as well as driver. In that first year he won the Indycar crown again, the only owner/driver to achieve the feat since AJ Foyt in 1975 and '79. In 1993 Rahal struck a deal with Honda to lead the Japanese manufacturer's entry into Indycar racing and Bobby talked to Newey about joining his CART team in Ohio. They met at the Canadian Grand Prix in Montreal, and Adrian and his wife flew to Ohio to visit Rahal's shop. "Bobby offered me a shareholding in the team, which was obviously very attractive, and I gave it a lot of thought," Adrian relates. "But in the end I decided that F1 was technically where the biggest challenge was and that's where I wanted to be. Attractive as working with Bobby and being a shareholder in the team was, I decided I would stay in F1." In 2000 Rahal was invited by Ford racing boss Neil Ressler to take on the job of running Jaguar's F1 team. Rahal worked at Jaguar for six or seven months in 2001 and tried without success to convince Newey to join him from McLaren. "When Neil asked me if I would be interested in directing the team I called Adrian and told him that I was looking to take over running the Jaguar team. At that point Adrian was not necessarily happy at McLaren, I think in part because McLaren was a lot more than a racing team. I think he saw that as a distraction. So we started talking. We went back and forth and he finally agreed to terms." But the growing presence of Niki Lauda and internal politics at Ford's Premier Auto Group scuppered the deal. "Lauda and myself had dinner with Adrian, but I sensed Adrian was very uncomfortable with Lauda," Rahal says. "He was trying to push Adrian to sign the paperwork at dinner. I said to Lauda that I would get it done, but I said that you can't push this guy. "There were other problems as well. When I had to explain to the CFO of the Premier Auto Group why it was worth signing Adrian Newey I thought, 'why do I have to explain this?' It should have been pretty obvious, but it wasn't. So the structure of the way things were done dissuaded Adrian, plus the fact that Ron [Dennis] pointed out that Ford wasn't going to be in F1 for the long run and that Lauda was going to fire me. I think the arguments he made struck home and in the end were proven right." Newey agrees with Rahal's assessment. "We got very close, famously close," Adrian remarks. "The chance to work with Bobby again was very attractive and obviously it was a new challenge and a huge challenge to join Jaguar and try to see what we could do with it. There seemed to be decent backing from Ford and a firm commitment, so it all looked very attractive. "But what gave me cold feet was it became evident that there were a lot of political machinations going on just below the surface. My attraction in going to Jaguar was purely and simply Bobby. I didn't want to arrive there and find that Bobby had been moved sideways or backwards and I was actually working for Niki rather than with Bobby. It became increasingly evident that was going to happen and that's why I got cold feet." The episode strained, but didn't damage, Rahal and Newey's friendship. "It caused us a bit of a glitch in truth," Adrian remarks. "But it's like any long-standing friendship. You can have the odd row here and there, but if you're genuinely good friends you get over it fairly quickly." Adds Rahal: "Adrian is a great friend. It was an emotional thing for the two of us, but in the end friendships are friendships and I think it shows the kind of friendship we have to survive such a thing and go on with our lives. The episode was a huge disappointment for me and I suspect probably an embarrassment for Adrian. But in the end I think he did the right thing." Today Rahal and Newey remain close, sharing a lightweight E-Type Jaguar to win the TT Celebration at Goodwood in 2009 (Adrian added a second TT win this year, partnered by Martin Brundle). "We have a common love for the sport," Bobby observes. "Adrian is a fan of the sport and I think that's the glue that's kept us together. I think his love of racing makes him a better person as well as a better engineer. He just loves the sport and has that competitive drive. He's a racer and I think the fact that he's a racer is what makes him a better designer. He's very competitive." Rahal is delighted to see his old friend thriving in F1 with Red Bull and has no doubts that the team's investment in Newey is the key to its current position in Grand Prix racing. "I think Adrian is a good leader for the engineering team and a lightning rod for the team. The young engineers probably worship him. He's the kind of guy that will take time to work with people. He's not imperious. And again, I think that's because he's a racing man who's always working with people to get the performance." Rahal's conclusion about his friend might strike a chord with Dietrich Mateschitz, the owner of Red Bull. "I've always said, give me Adrian Newey and he'll design the best race car and we won't need the best driver to win," Bobby says. "Give him the money to design the best race car and you can take a driver for less money and win races. Give the driver $2 million and Adrian $9m and you'll get a lot more value out of your money than by giving it all to the driver. If you've got the best race car you don't need the best driver."